Finding the right guitar amp is the first step to finding your ideal tone. Plugging in your guitar and effects pedals can bring a challenging process of tweaking the knobs trying to find the best sound. The sound from a triple-rectified amp head will differ a lot from a smaller tweed combo amp. Always plug into and play the amp you are interested in before you buy it. Also, check out the Buying a Guitar Amp page. Once you've found the right guitar amp, you're going to want that amp to sound great while you play through it. Begin with the volume knob. Plug your guitar straight into your amp without effects pedals. Once you get the amp sounding great by itself you can add these effects into your rig easier. 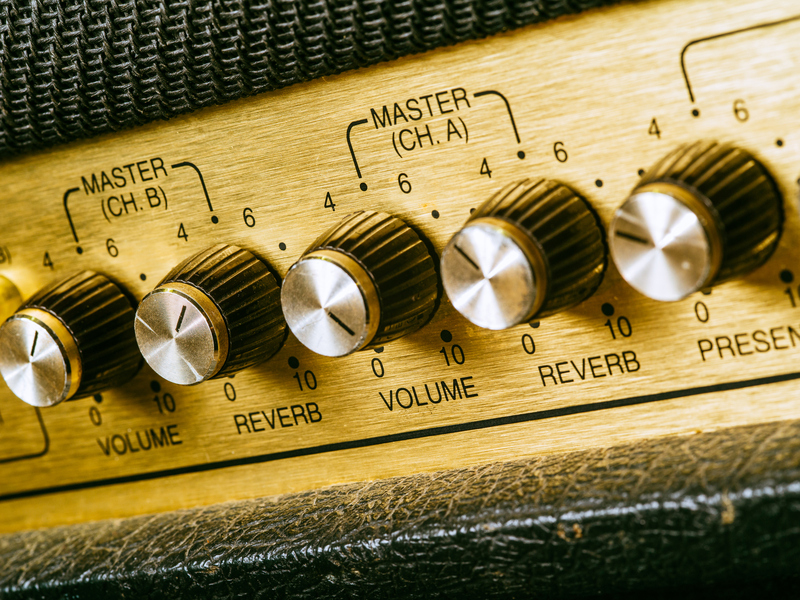 Turn the volume knob of the guitar amp up to the level of how loud you're going to want to hear yourself play. You may need to come back to the volume knob after making a few more adjustments to the other knobs, but the volume level is a good starting point of how you're going to hear the amp in general. After the volume is set to a good level, find the drive or gain knob. Depending on the amp this knob may be labeled one or the other. Drive or gain refers to how much the amp will push the sound of the guitar's signal through the guitar amplifier. This knob will also interact with the volume knob a bit, so you may need to readjust your volume knob again. The more drive or gain you use the more distorted your tone will be, and using less gain or drive will keep the sound more clean sounding. Set the drive or gain high for heavier music like rock or metal, or keep it lower for other sounds. Finding the right amount of gain or drive can also allow you to play the strings softer for somewhat cleaner tone, and then a crunchier tone by playing the guitar a little harder. This is nice sometimes for single channel amps. If your amp has multiple channels you can set a clean tone as well as a distorted tone on the other channel. The bass or low, mid, and high knobs control the EQ frequencies and voice of your amp's tone more than the others. Finding the right combination of these knobs can be tricky. Guitar amps are made or paired with a few different types of speaker enclosures. These enclosures make the amp sound different than other enclosures will, and the low, mid, and high knobs will interact with the speaker enclosure for different sounds. Closed speaker cabinets and closed back combo amps tend to have a bassy tone compared to open backed enclosures and combo amps. If you're playing through a guitar amp with an open enclosure or back you might need to compensate with less mid and high tones due to the natural mid and high tones created by having an open speaker enclosure. Open speaker enclosures do this because the sound can escape through the back as well as out the front. Closed back enclosures create a more bass heavy tone due to the sound coming out only through the front and the sound bouncing off the back of the enclosure. If you have a closed back speaker cabinet you might need to use less of the low tones to keep the sound from getting too muddy. Keep this in mind when adjusting the low, mid, and high knobs. Start with each of these knobs around the middle position for each and boost or cut each of them as you play to start shaping your guitar amp's tone. For a warmer tone, keep the lows at a good level to provide a full, bassy sound. Back off the high knob if the tone becomes to brittle or tinny sounding for your liking. Adjust the mid knob as you see fit for the rest of your tone shaping. For heavier music such as rock and metal, cut the mids way down or completely while turning up the lows and highs. This is also called "scooping the mids". This will give your tone a crunchy tone for rhythm or even lead guitar. Some amps have a reverb and/or presence knob. Think of these as adding seasoning to your tone recipe after you set the lows, mids, and highs to your personal taste. Reverb alters the guitar's sound to recreate the subtle echoes of a room or other environment. Too much reverb can sometimes take away some of your tone, so set this to your liking depending on the sound you're looking for. If your guitar amp has a presence knob you can adjust this to help shape how the sound is "present" in the room you're playing in. Boosting this knob will interact with the mid to high frequencies of your sound to add a little extra boost to the high end of your sound. Turning down the presence knob will interact more with the mid to low frequencies. One of the biggest factors and secret to great guitar tone isn't found on your amp or by tweaking a knob to find the best sound. This is up to you and your fingers. How you play your guitar creates the sound and tone more than you might think. How you fret each string and pick the strings is the biggest factor driving your amp tone. Play each note or chord with the intention of it sounding as good as it can be played. Think of this as your tone's fingerprint. Once you are happy with the settings on your amp and the tone it creates, plug in some effects pedals if you wish and shred away!